Twice a year, Berlin becomes an international stage for fashion and lifestyle. 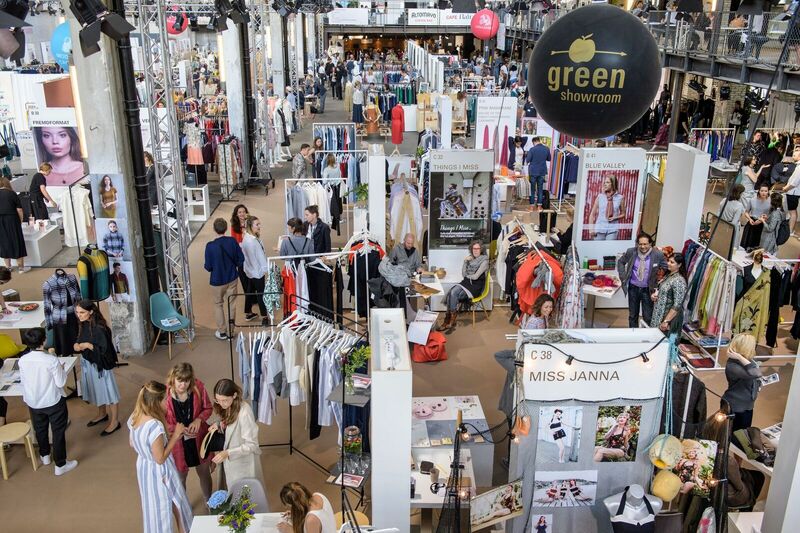 At the Berlin Fashion Week, fashion-lovers, buyers, trade visitors and media representatives meet for shows and awards, find out about latest collections and trends at the trade fairs, visit exhibitions and off-site events. One of the key highlights of this fashion week which is of great interest to us UrbanMeisters is the Greenshowroom and Ethical Fashion Show Berlin at Funkhaus. Our founder Mirela attended this in 2016 and gave us first hand review of all the excitement, green energy and sustainability quotient. The Greenshowroom, features collections by more than 150 designers. The Ethical Fashion Show is a high-class event programme with lectures, discussions, guided tours and the fashion show “Ethical Fashion on Stage” turning Funkhaus Berlin into a hotspot for sustainable fashion. Though the central focal point is “retail”, various themes, discussions, brand showcases happen at the event. Exceptional collections from young designers, get supported and promoted by different institutions with influencers, bloggers etc. We bring a special feature on one of the brands that presented their collection at the Berlin Fashion Week 2017 – Movinun – and a tête-à-tête with the two founders. Over to Maša and Boštjan! Hello UrbanMeisters….So nice to meet all you green enthusiasts! 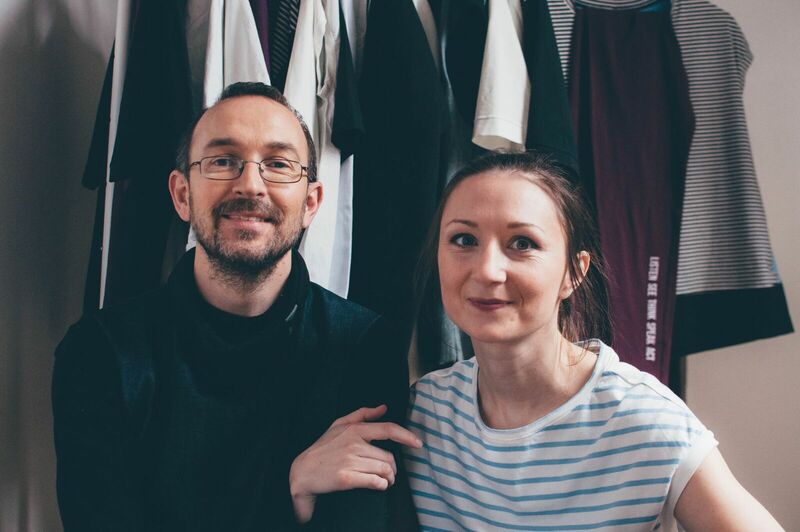 We are Maša and Boštjan, co-founders of Movinun (well, actually we are Movinun :), a startup independent fashion brand from Slovenia. 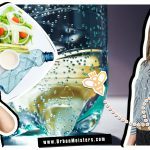 Of us, Maša is an architect by profession and designer by heart and Boštjan is a psychologist by profession and very much into sustainability issues. So we gathered our forces to establish a Movinun brand about a year and half ago in order to spread sustainable fashion in Slovenia and worldwide. Because we want clothes to be good for the environment, we use materials that hold at least Global organic textile standard certificate. Because of that we can trust our suppliers and know that their production had as little effect on environment as possible and that their workers are safe and paid fairly. We produce in small batches because we don’t want to have an abundance of clothes that would need to be thrown away at the end of the season. 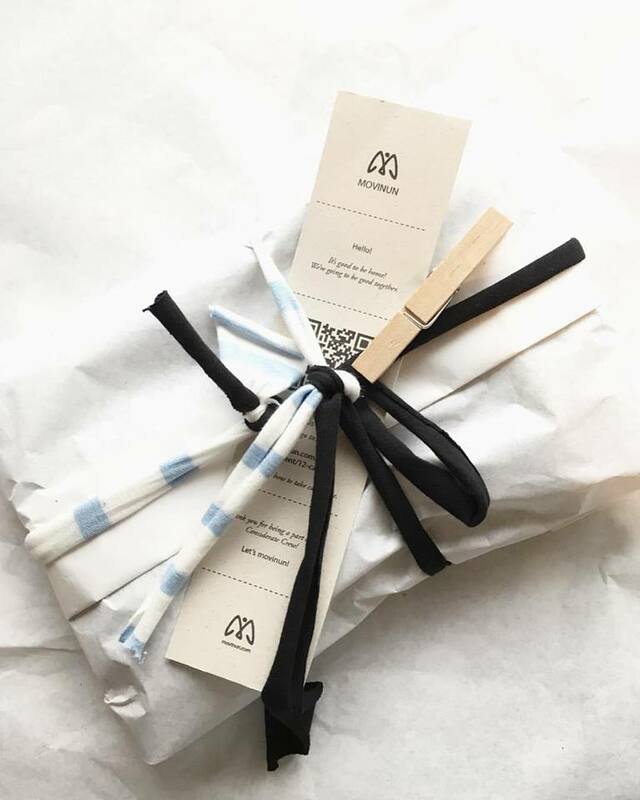 We try to make as little waste as possible, that’s why we use our scrap materials to make something new – like small accessories, key chains or nice wrapping for the packages we send to our customers when they place an order. In our studio we use green electricity. When we outsource the sewing to other companies, we work with local organisations in Slovenia to reduce carbon footprint as much as possible. To be as socially responsible as we can, we collaborate with organisations that employ specially-abled people and we couldn’t be happier with their work. We also support initiatives that take care of animals and their rights by donating our garments for the auctions and similar causes. We put a lot of emphasis on the design. Besides carefully choosing sustainable and durable materials, our pieces are designed to be worn through many seasons. Our line includes garments that can be mixed together in different outfits, and can be worn easily with all your existing wardrobe favourites. We want to design clothes that can create a lot of different possibilities in “how”, “with what” and “when” you wear them. We are most proud of our pieces that can be worn in different occasions – from a picnic by the lake to evening dinner in the city. We also love it when we make something that is gender neutral. 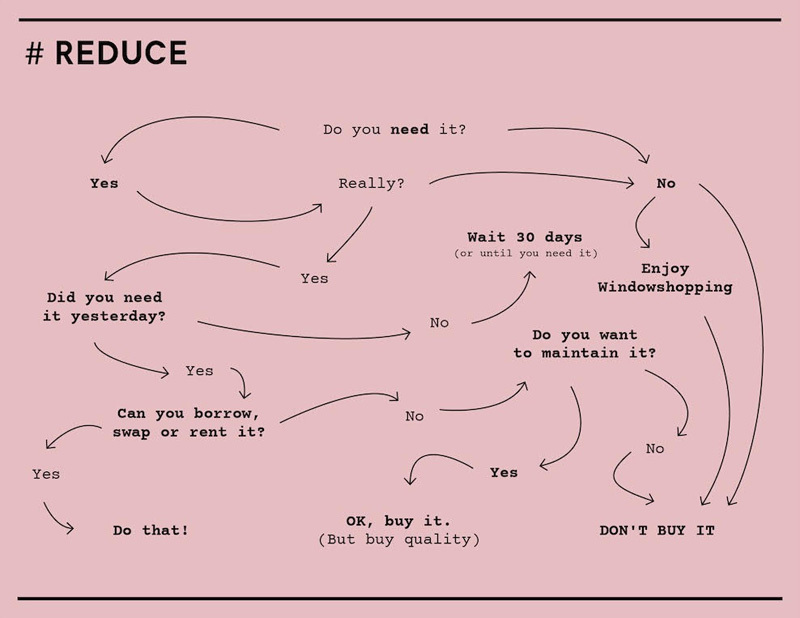 Because then you can swap easily with all of your friends, or at least those that have a good taste in clothing ;). Because we want people to love their clothes and feel unique, we use small details, like handmade porcelain buttons (made by Maša’s mother), interesting statement zippers or hand screen prints. Since we want to be socially responsible and hope to encourage other people to be engaged as well, we screen print little reminders on our garments. 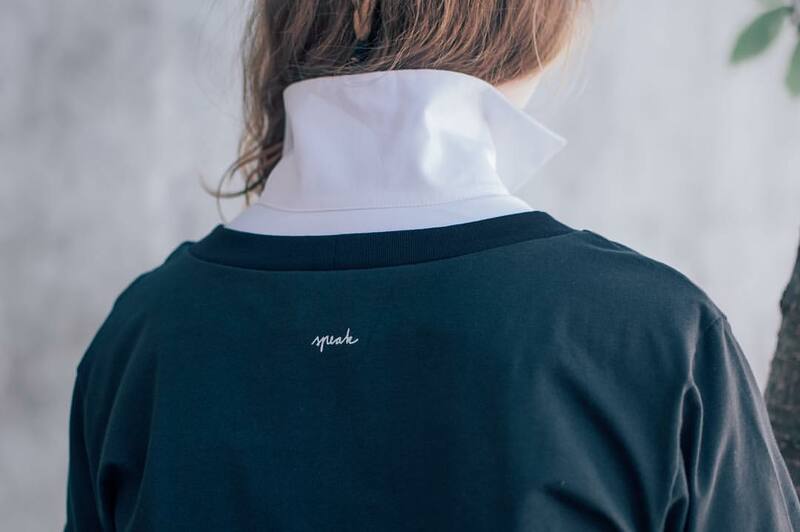 Like small handwritten word “speak“, that can be found throughout our line. Like UrbanMeisters, we do not want to be too pushy and scare or bore people with difficult topics like global warming, gender inequality, refugee crisis, so we try to communicate those in a relaxed way. We share examples and good practices of how to participate in the issues of our time. We also share different events and examples of sustainable living on our Facebook page, we remind people of the beauty of our nature with different pictures shared on Instagram and Facebook profile. To relax everything a little bit, we publish some humorous thoughts and good music videos as well. We present our clothing line in different places – we have a small shop in the city centre of Ljubljana, we take part in different pop-up shops and try to communicate with media as much as possible. Last week we presented our work at the Greenshowroom at Berlin fashion week. It was a great experience for us and we would like to encourage all of you that work in ethical fashion to at least visit both Greenshowroom and Ethical fashion show or maybe even present your work there. It was our first fair of this scale and we made a lot of new connections. With suppliers, with concept shops that focus on sustainable fashion, bloggers and media. We’re happy to say we started some new collaborations with some amazing people. We had good support from the organisers, we were also able to present our work to bloggers trough prePeek event, where they were able to try and test different outfits. Unfortunately we did not have any time to attend all those interesting lectures and other events, we were too busy communicating with visitors at our stand. But we liked the atmosphere, we liked exchanging new and useful information with other brands and we can say we will definitely be a part of next Berlin fashion weeks. 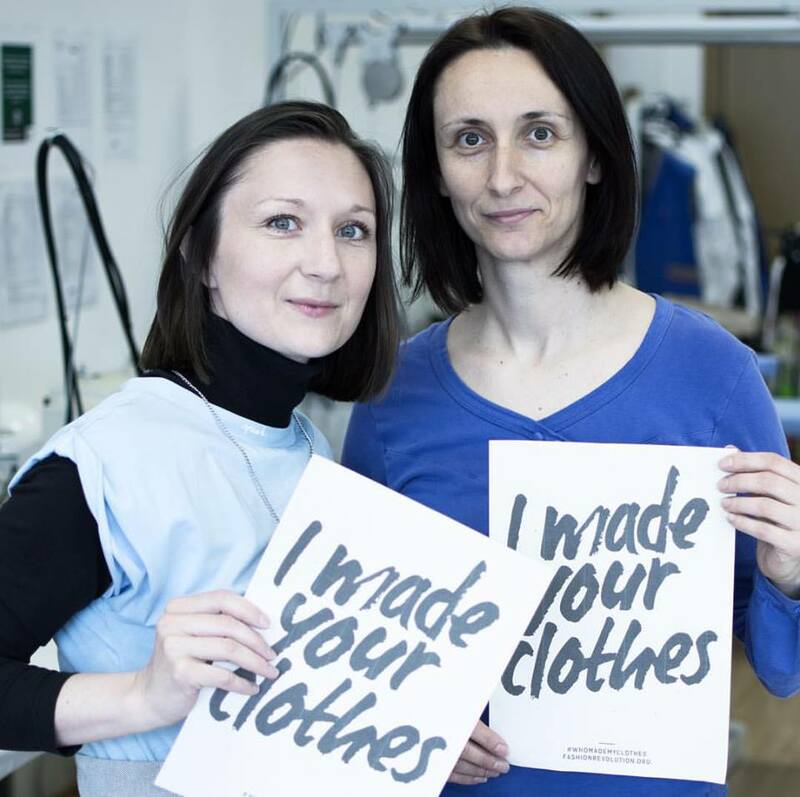 To reach a re-thinking in consumers minds that even the consumer needs to act, The Fair Fashion Guide was developed by Dr. Gisela Burckhardt from FEMNET inc. and Prof. Friederike from Wedel-Parlow of the Beneficial design institutes. Our carefully designed and individually produced men’s and women’s lines both integrate street-smart style as a base. What we bring together is tomboyish aesthetics mixed with elegant forms and delicately handcrafted details. Our look is bold and urbane. Powerful silhouettes accent our revolutionist mind, but are always comfortable and never binding. In our designs we favour almost only monochromatic palette, with some pale accents of navy and indigo, sometimes violet. Our high-impact graphic elements are achieved with our hand screen-printed motives. These are our “call to action” elements which we continuously intertwine throughout our line, especially the handwritten “speak”. Our signature garments are beautifully tailored shirts, pleated skirt of a nearly ball gown proportions, slouchy and comfortable sweatshirts and tees. Paired together, these pieces create our signature street-smart visual style. Our garments can – in many cases – be worn by both women and men. Each piece is made individually and from the highest quality organic cotton and organic linen with at least GOTS certificate. For the screen-printing, we use ecological, water based inks with Oeko-tex standard. Because we want to create timeless pieces, we stepped away from creating seasonal collections and focused on core classics every wardrobe has. That allows us to evolve our ideas coherently and fully while taking our time with the process.